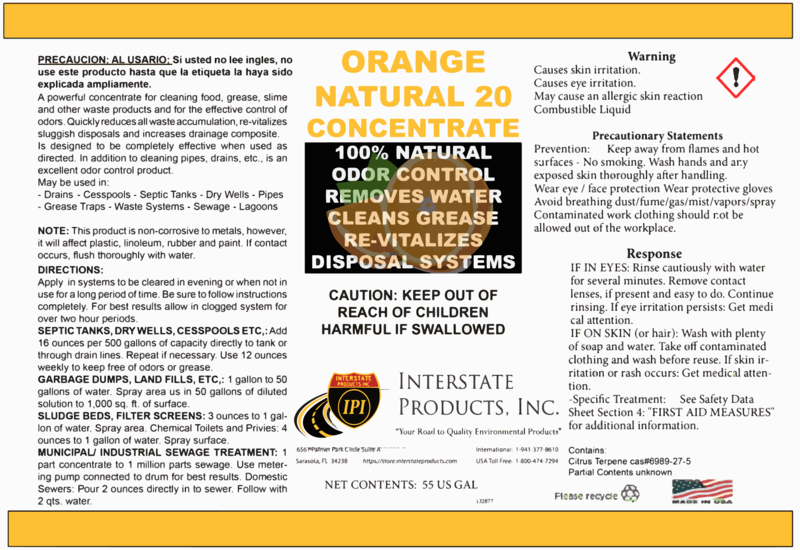 Orange Natural 20 Concentrate - Interstate Products, Inc.
Orange Natural Concentrate Cleaner is a natural water dilutable citrus product that derives its strength from citrus extracts and biodegradable surfactants. This orange based formula that removes black heel marks, tar, gum asphalt stains carpet stains, scuff marks, ink, oil, grease and a variety of other difficult soils from ceramic, formica, glass, vinyl, tile, and concrete. Use straight for solvent like degreasing actions. Heavy soils use 15-20 oz. per gallon. Light soils use 4-5 oz. per gallon.